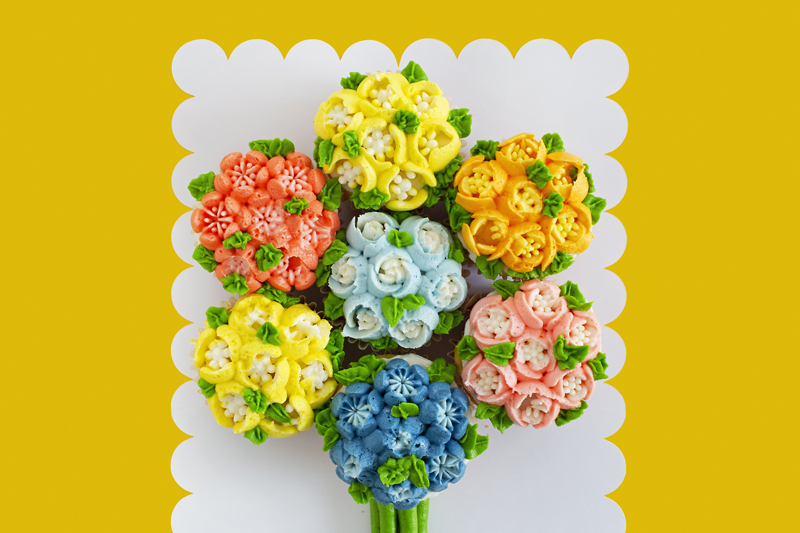 Inside: How to make and frost a cupcake flower bouquet using Russian piping tips. Three Christmas’s ago, I received these Russian piping tips, that I had never seen before. They were HUGE, and had the weirdest designs. Well it took me three years to finally figure out what they are, what they are called, and what they do. 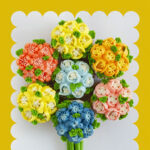 They are called Russian piping tips, and they make piping flowers for a cupcake flower bouquet SO EASY! You can buy your own gorgeous set right here. Now I can finally (truthfully haha) say I’ve used the piping tips, and that I love them! Make your own cupcake flower bouquet to deliver this Valentine’s Day or really any day to make someones day instantly brighter. 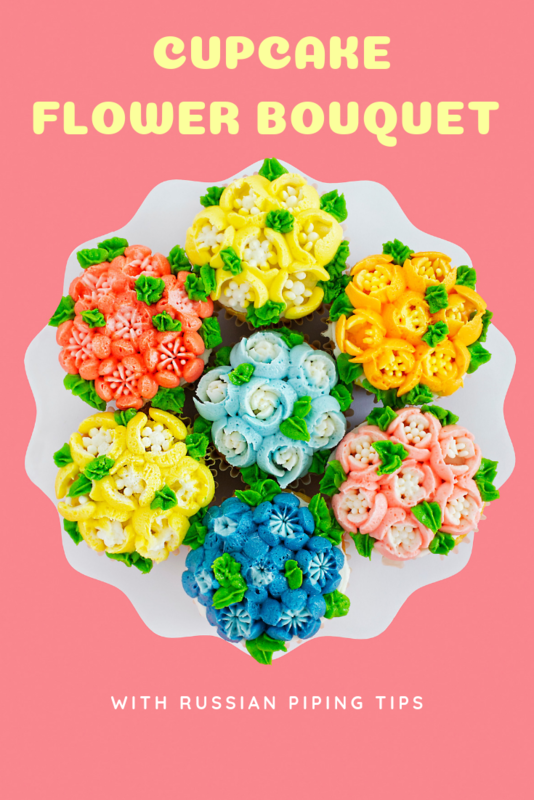 Cupcake flower bouquet recipe created with buttercream and Russian piping tips. Mix the box cupcake mix with ingredients as the box will tell you. 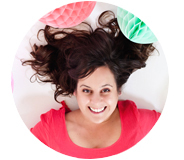 Place in a cupcake tray with liners. Bake in a preheated oven at 350 degrees for 18-21 minutes. Allow to cool to the touch on a counter and then place in the fridge to chill for up to 1 hour. While they are chilling mix the buttercream to frost. These are going to turn out gorgeous no matter what! Now make some American buttercream, and remember STIFF PEAKS are the key. Start by beating the softened butter for 5 minutes. No more, no less. Gradually (no powdered sugar snow storms) add the powdered sugar, until combined. Slowly mix in the milk, vanilla, and the salt. Concentrate on STIFF peaks as you add the milk, and vanilla. These flowers won’t work with a soft buttercream. So if you realize you have added enough milk before adding all of the milk called for, stop adding the milk. STIFF PEAKS. Now it's time to color! Pick your favorite colors of food coloring (I use Americolor for the most brightest, and vibrant colors), and start mixing colors for your bouquet. Once you are happy with your color palette, place the Russian piping tips into large piping bags, and cut off the end. Add your frosting to the piping bags. 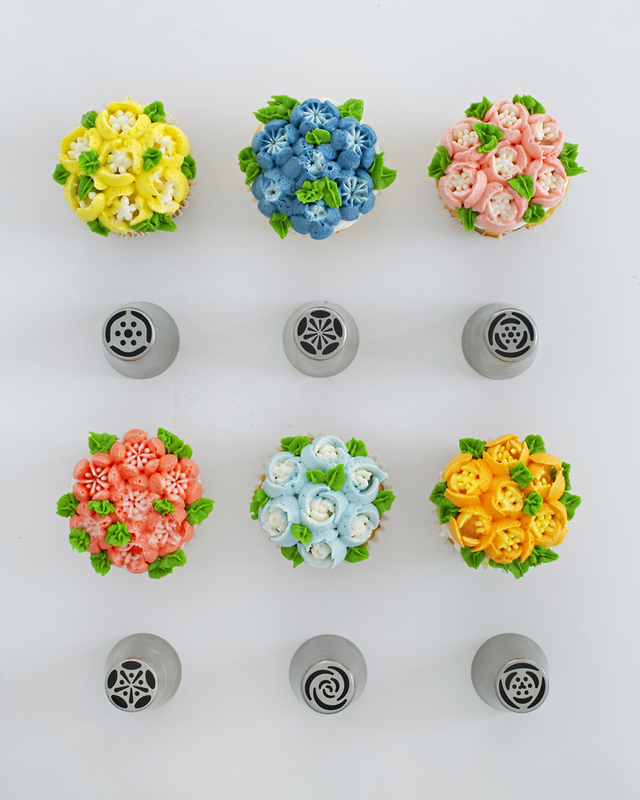 Use this Russian piping tips chart we have here to determine which tip to use for which flower design. They are all pretty and I think mixing them up creates the best looking cupcake flower bouquet possible. 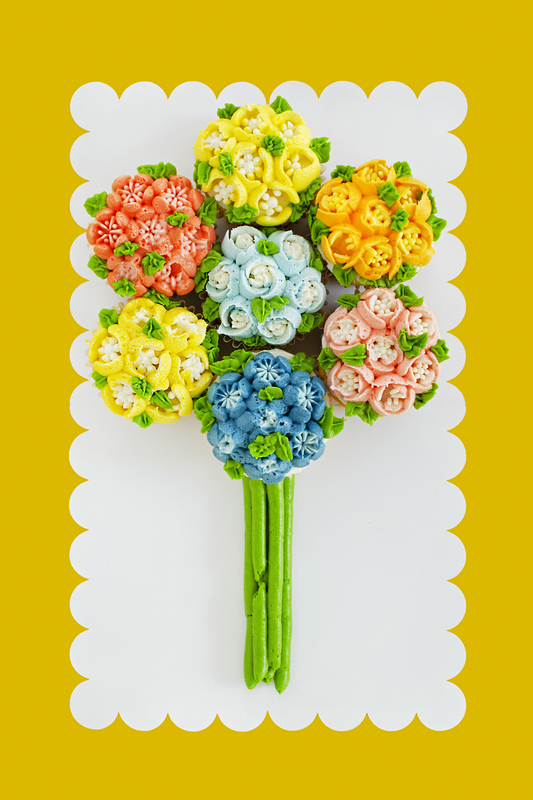 Here’s how to get a perfect pull away when making your cupcake flowers… Hold the tip close to the cupcakes, almost touching, squeeze, and pull away. These tips aren’t made for the tallest of the flowers. They look better short, to show off the stamen inside the petals. 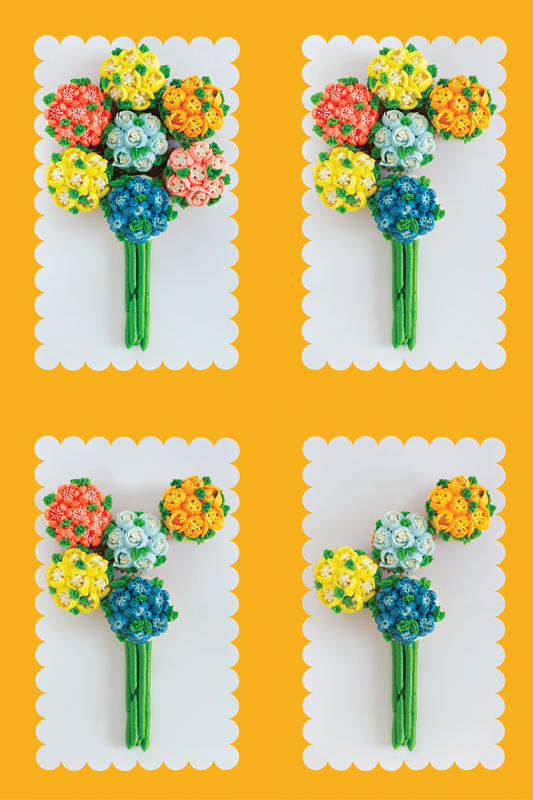 Now that you have the hang of it – experiment with different tips, and create a beautiful bouquet of cupcakes. Once you are happy with the flowers on your cupcakes, add leaves to add even more detail, and beauty to your floral cupcake bouquet. Happy piping. PS. And while we are thinking about Valentine’s Day these ones are cute and here’s another sweet treat you might want to try. Very pretty! I have had Russian piping tips for about the same amount of time but have never used them yet. Is there a certain way you put the colored icing and white icing in the piping bag to get the white icing more to the center of the flowers? Thanks.